I have a request. I started researching our family tree over 24 years ago. Aunt Margaret had a big box of pictures and one was of this heavy lady, but attractive. I was looking at the picture and Aunt Margaret stated that she was Uncle George Rice Vanzant’s wife Maggie Evans who was an actress of sorts back long ago. Uncle George was a stage hand. I have various pictures of him with other workers. He even makes reference he was in one play. George came back to Anniston, AL where he died many years ago. I have often wondered if he had a wife. Today I found the information I had been looking for. George Rice Vanzant was married to Margaret Evans. 1930 he was 36 and Margaret was 34. They were living in Manhattan, NY with her two children from a previous marriage and her father who was from Germany. The children are Chester Evans age 14 and Richard J. Evans age 12 and John Reinhardt age 68. Margaret’s first husband and the father of her two sons was Earnest Evans. I am going through all my notes trying to get them all put here on the web site. There are boxes full of papers so be patient. I found this legal pad sheet. I believe it was sent to my by Signe Cowan. It was taken from her husbands Family Bible. Father George Rice Vanzant Place of Birth, Upper Darby, Delaware Co. Pennsylvania. Date of Birth January 22, 1834, Date of Marriage September 7th, 1856 , Date of Death January 9th, 1918. Children of this union, Willis K Vanzant ( My Gr grandfather). He was born October 10, 1869 in Upland Delaware Co, Pa and died January 21, 1939. Hannah Born in Upland, Del Co Pa July 25th 1871. She had been married twice. OnceJune 20, 1899 and the second January 18, 1906 to Frederick A. Cowan and she died Nov 1955. Abraham Vanzant was born Feb 18, 1810. He married October 30, 1829 and Died January 10, 1888 age 77 years. Mary Ann Vanzant wife was born March 1, 1811 Her maiden name was Verlinden or Verlenden. 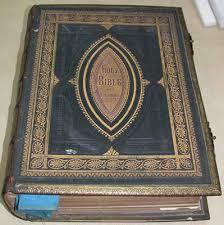 This was copied from Grandpa Vanzant’s Family Bible.